I’ve just been nominated for two awards. I don’t see this as a “how great am I” thing, but rather as a pat on the back from fellow bloggers. What I like most is being able to pass awards on to other people. “Liebster” is German for “Dearest”. The award is a “Share the love arrangement”, given to inspirational bloggers with less than 200 followers. I was nominated by Mary from the fabulous blog tothebalcony. Thanks Mary! I always like checking out your blog. Now it is my pleasure to present the Liebster Award to 5 bloggers. 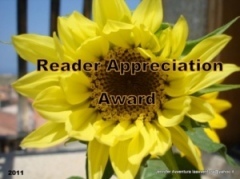 Heather from the very cool blog bitsnbooks nominated me for this award. Thanks Heather! I love the photos on your blog and your way of looking at the world. The rules of this award is to pass it on to 6 other bloggers whose blogs you like reading and then say what you’ve been up to lately. As I just nominated some blogs above and recently nominated even more blogs when I received two other awards, I’m going to keep this to three book blogs that I read a lot! What have I been up to? I took advantage of a truly miserable rainy weekend in Sydney to have a TrueBlood Season 4 marathon. I am now vampired-out. Thank you! Thank you! This was such a wonderful thing to see in my inbox the other day. It has been one helluva week so I haven’t gotten a chance to sit down and properly say how much I appreciate this until now. Really, it is so heartwarming (I know it’s cheesy to say that and I don’t care) to get recognition like this. For me, none of this is about having a million followers, it’s just about doing what I love: writing.